Alessandra and Vincent’s downtown Tampa wedding embodied a whimsical winter wonderland with elegant mismatched centerpieces and a romantic color palette of dusty blue and champagne gold. Dripping with personalized details, the bride and groom celebrated their Italian and Hispanic culture with a cigar roller and chicken and waffles during cocktail hour. 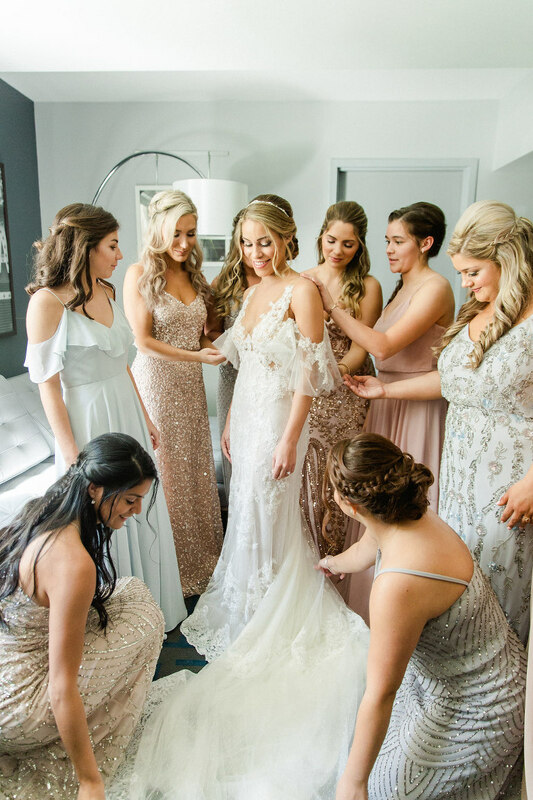 With the help of Marry Me Tampa Bay, the bride browsed real weddings and incorporated inspirational elements into her own celebration. Wanting to ensure their wedding day truly represented their personalities and love for each other, Alessandra and Vincent made sure every detail was unique to them as a couple. Reminiscing on their whimsical winter wedding, the bride and groom loved sharing their day with loved ones. We had been dating for almost two years, and I had been begging Vincent to attend Mickey’s Very Merry Christmas Party at Disney World. Needless to say, he gave in and planned a long weekend getaway to Disney for the two of us, but failed to mention he had a few surprises up his sleeve. We had a fun-filled day at the park and returned to our resort to get ready for dinner. Of course, I asked where our reservations were but he would not reveal that information. So, I blindly got dressed for dinner and off we went. I knew something special was going to take place because he seemed to be very nervous but I didn’t read too much into it. We walked through security separately, and through the gates of Magic Kingdom. I soon realized we were walking to Cinderella’s Castle for dinner, and I could not have been more excited to have dinner with the love of my life and all of the princesses. As we finished the main course, our server mentioned he would be back with our special dessert, but we had not ordered dessert. As our server arrived with our dessert, he unveiled Cinderella’s glass slipper with rose petals and my prince charming was down on one knee asking me to spend the rest of my life with him. I could not have screamed, “Yes!” more loudly! Our magical night continued when Vincent’s family surprised us outside of the castle, and we attended Disney’s Christmas Spectacular following the engagement. It was truly a dream come true, and our lives together have been nothing short of a fairytale. My main inspiration was Cinderella. I have always loved softer colored blues paired with gold and wanted to incorporate other colors with mixed metals. I was specifically looking to avoid your typical Christmas themes and colors. I had this gorgeous vision of winter wonderland meets bohemian chic. I envisioned lots of greenery, unique décor along with pops of color. With lots of inspiration from Pinterest, I started to build my dream wedding and eventually brought my boards to life! 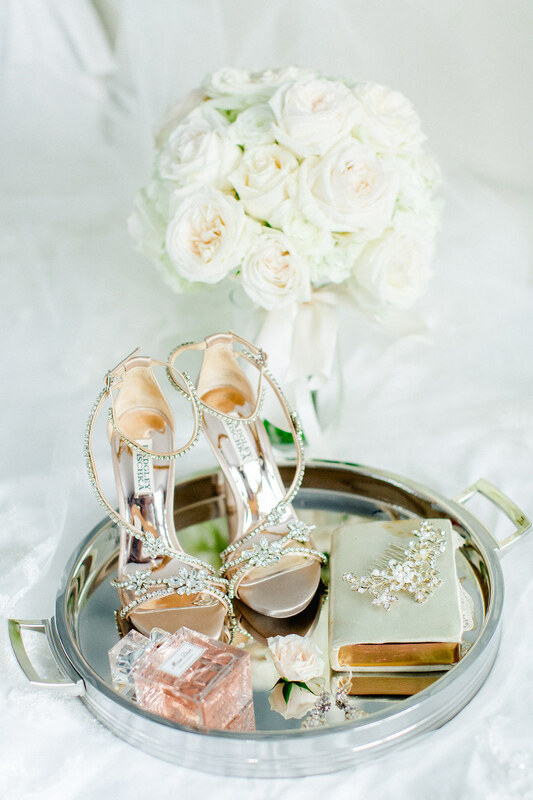 A mix of pastels and metals. I chose dusty blue, mauve, blush, platinum, and champagne. I chose these colors because of my love for Cinderella. 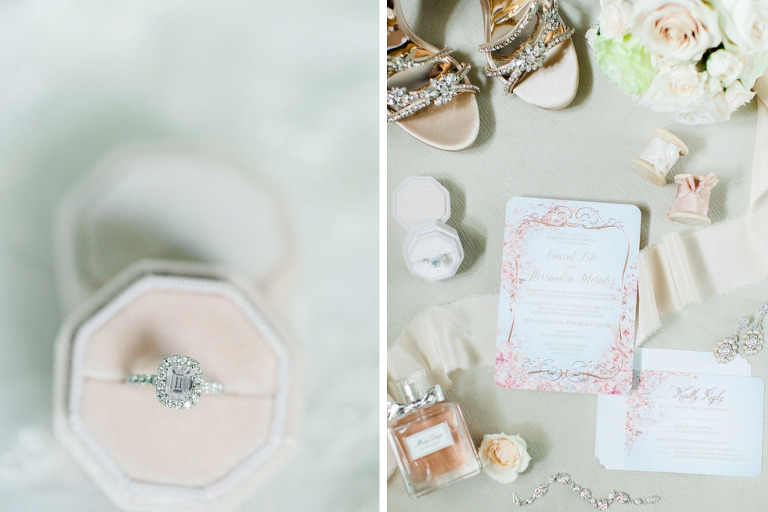 The soft look of pastels accompanied by some bling brought my bridesmaids to life! My husband has blue eyes, and I thought the navy suits would really bring out his eyes. We aimed to keep the flowers simple since we had so many colors. I stuck with the Cinderella theme for our reception with pastel blue linens and gold floral chargers. The centerpieces for the reception consisted of three different styles, each very unique. Sit down and decide as a couple what you both want your wedding to be and what you both want to get out of it. What are the most important parts of the wedding to you both? Once you have that list, then you can start to build a budget. You can really start to see where money can be saved versus splurged. I also want to stress, do it together and have fun! The process was very stressful at times for me, but my husband was extremely patient and positive. I regret not enjoying it as much as I should have with him. This is one of the biggest life events you will both go through, and it can be stressful at times. Always remember you are going through it together so enjoy every moment, good or bad!